Welcome to Pullman Sydney Airport. Global nomads have a new Sydney hub. The light-filled lobby blends cool, contemporary style and functional design to welcome guests to Pullman Sydney Airport. 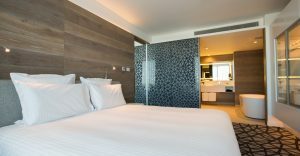 The only 5 star Sydney Airport hotel offers 229 rooms and suites with smart open layout and all-round connectivity. From the Domestic Terminal, our airport hotel is in the centre of the Mascot business park area. Mascot station is steps away, and trains get travellers to the International Terminal in five minutes and to Sydney CBD in less than fifteen minutes. Alexandria’s vibrant restaurant and café scene is on the doorstep. Choose from whatever you’re fancying: Gelato Messina Rosebery, Black Star Pastry Rosebery, Da Mario Pizza, and Bourke Street Bakery are just a few amongst the local favourites. Or, if you’re feeling like a climb, stop by 9 Degrees if you’re up for a physical challenge. Mobius Bar & Grill is a flexible, evolving dining adventure, with seasonally inspired cuisine accompanied by regional wines and local craft beers. It’s the place for chance encounters, let’s-make-a-deal dinners or wind-down drinks. Globetrotters stay connected with ultra-fast Wi-Fi in the lobby Connectivity Lounge and throughout the hotel. 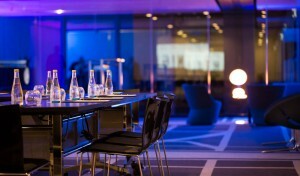 Versatile meeting spaces, the best technology and dedicated Event Managers let teams focus on work. The second-floor Fit Lounge is the place to regenerate and re-energise. 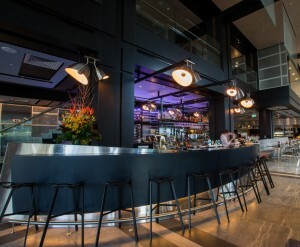 Pullman Sydney Airport understands the modern nomad – because our world is your playground.